I have always owned alloy boats for two reasons: light to tow behind the car and bullet proof at sea. My 610C is now three years old and has given me hundreds of hours of trouble-free operation. The best thing ever offered in the package to me was powering my boat with a 140 Suzuki four-stroke outboard. Performance, economy, low noise above and below the water line and low maintenance, all the hallmarks of a quality Japanese product. With the current ‘standard’ prop she gets along at max of around 37 knots @ 5200 rpm (Wide Open Throttle) and will cruise comfortably at 22 knots @ 4000 rpm all day with phenomenal fuel economy. The overall presentation of the boat was of the highest standard. Very impressive welding and great craftsmanship in these vessels. Out on the water it stands alone with the unique water ballast system that fills with water and lowers the vessel down on its chine’s for better stability off shore, drifting or anchored on the reef. Its ride in poor weather conditions and in a following sea makes it smooth and safe if you need to get to port in a hurry. I was limited to the total vessel height on trailer as it had to fit into my garage. The fold down windscreen and roof made this storage issue a job easy. 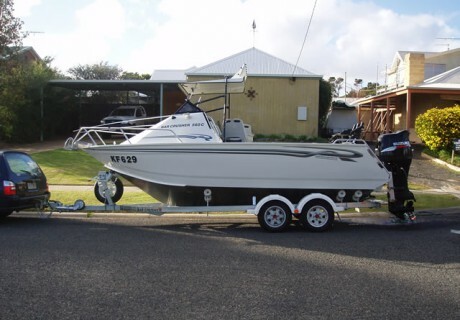 All aspects of my boat motor trailer package makes it a very versatile fishing/diving platform which my twin sons and I use often. I look forward to many years of trouble free boating from my Bar Crusher and hope my sons as they get older will take me along. My offer still stands regarding helping out if you are ever doing any demo days as I would love to help spread the word.